Best New Crispy Cook Recipe - My Hearty, Smoky Vegetarian Pea Soup recipe gets the nod for best new thing I concocted, plus extra points for being awesomely cheap eats. In fact, I think I have to go get cracking on a pot after typing up this post. 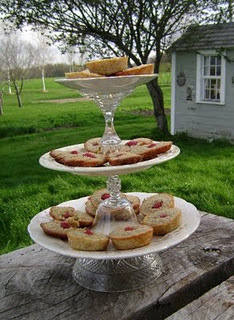 Best Thing I Cooked Up Courtesy of Someone Else's Recipe - That would have to be Elizabeth Bard's wonderful Raspberry Financiers, a nutty, buttery, raspberry-dolloped French cookie from her book Lunch in Paris, which I read as part of the fun foodie book club, Cook the Books. Incidentally, that three-tiered cake plate was also the coolest craft project I tried all year -alright all decade-, made from some scavenged fancy saucers, a candlestick, sherry glass and glass bowl, all glued up with some ceramic cement. Best New Thing I Grew in the Garden - Though I truly enjoyed shearing off delicate fronds of chervil for my summer salads and played around with kohlrabi quite a bit, I would have to say that the thicket of lemongrass that I grew from some slender seedlings from my friend Andrea takes top prize. I loved having fresh lemongrass to chew on as I weeded the garden and it made lovely tea and additions to various Asian dishes. Best Cookbook I Reviewed - There were some wonderful new cookbooks sent to me by various publishers to be considered for review here at the Crispy Cook. Hands down, though, the winner was Laura B. Russell's The Gluten Free Asian Kitchen. I have cooked and cooked from this great book and each dish has added a new dish, ingredient or technique to my repertoire. If you love Asian food and are adventurous in the kitchen and the grocery store, this book is for you! Best Photo - I think this handsome Broccoli Pasta Timbale shot was the best thing to pop out of my digital camera. And it was a good recipe too. Have to try that one again soon. Best New Gluten-Free Product I Reviewed - Here we have a split at Casa Crispy. I and one of my daughters vote for Zatarain's Yellow Rice as the item most likely to make its way into our supermarket cart. I pop it into our rice cooker for an easy side dish that everybody always eats up. Husband Dan and my other sweet toothed daughter vote for Namaste's Chocolate Cake Mix, which gets requested for special occasion cakes and gets brought to friends' houses for a dessert that is so moist and that noone ever suspects is gluten-free. 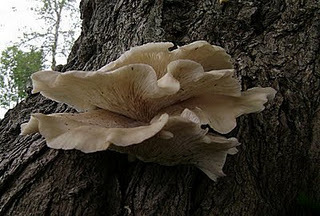 My Favorite 2011 Post - Though I never thought I'd be a mushroom hunter, let alone find a serendipitously beautiful and lush batch of Oyster Mushrooms in my woefully under-forested backyard, I came out one day during my garden stroll to discover, research and harvest a beautiful specimen that fed us for two suppers. Along the way I had fun participating with other Capital District food bloggers in a taste test of some Big Kahoona Barbecue and joined other blogger buddies online in various blog events, including Weekend Herb Blogging, Presto Pasta Nights, My Legume Love Affair, the aforementioned Cook the Books Club, and the Gluten Free Ratio Rally. I look forward to more food adventures with them and with you in 2012. I'll also be reviewing some more books, products and letting you know about gluten-free restaurants, events and other news in the Capital District. There may be more giveaways too, which leads me to my announcement of the winner for the Red Pack Tomatoes Giveaway, which is commenter number 9, Debra. Congratulations Debra! Send me an email at info AT oldsAra togabooksDot com with your shipping address and phone number and I'll forward the information to Red Pack so that you can receive your prize. Hi Rachel, I have to agree that The Gluten-Free Asian Cookbook was a gorgeous book that didn't disappoint my family either. Lots of good food coming out of it at our house too. Would you be interested in joining my series this year? I'm having guest posts on Fridays with the theme "In My Gluten-Free Kitchen." You can answer on the contact form on my blog. Scheduling for the whole year right now. Thanks again for including me on your blog list.